A Put simply, we create software that helps to save lives and protect and preserve society. In the UK, half of all police forces employ our technology and we also serve the transport and aviation sectors. Internationally, we have an ever-growing presence. Cortex, our Integrated Communication Control System (ICCS), is used in more than 70 control rooms globally. Cortex has recently become the first software to be officially certified to support a new state-of-the-art LTE-based Emergency Services Network (ESN) for the UK’s emergency services. It means we’re in pole position to support the blue light sector as it undergoes a communications revolution. 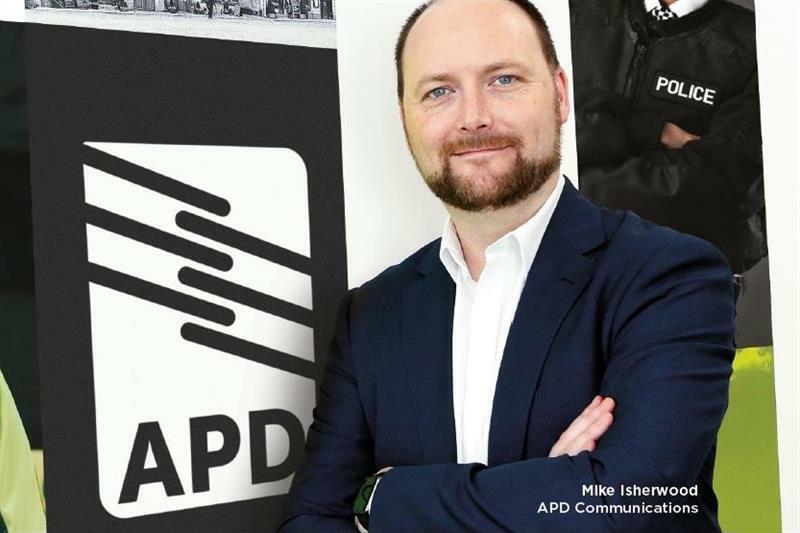 The UK is leading the way in the latest technology to support mission-critical control room organisations and APD is on the crest of that wave. Q What are the challenges created by ESN for technology suppliers and control room operators and how have you worked to address these? A The real challenge is to focus first and foremost on delivering business as usual. We’ve achieved that with Cortex, as shown by gaining the official accreditation. The transition to ESN will happen on a phased basis over the next two years, but you could turn on our system today and I guarantee it would work. We’ve got there first with certification for ESN because of simplicity of purpose – a strong focus on delivering business as usual. It’s a very simple foundational principle based on a recognition that despite technical changes, the customer must be able to continue doing their job. The technical complexities they leave to us – all they want to do is come in every day, do their job and save lives. Having achieved business as usual, we’re now working on the technologies that will help control rooms to deliver advanced features such as video into the control room and integration with body-worn cameras. We’re working on the next-generation features that ESN and LTE enable. The biggest technical challenge is developing software against a developing platform, Motorola Solutions’ LTE solution, Wave, which is itself developing. That means we have had to be incredibly agile and reactive to changes. We have a dedicated team of engineers who are experts in radio over LTE communications. They have been on this project from the beginning and they’re developing the software every single day. As changes come up, they rework and improve solutions and they write new features. This is agile, real-time development. We have a well-defined plan, but we constantly adapt based on feedback from our customers. Also, Cortex is a software-only solution. Unlike other vendors that have a lot of proprietary hardware and legacy systems built into their solutions, we’re software only and software can be adapted easily. Hardware can’t. Suppliers with a mix of software and hardware have their flexibility severely constrained. We started our software-only journey five years ago – we deliberately removed hardware from our solution because we were moving towards hosted and cloud environments. Our solutions are IP-based while others are a mix of analogue, digital and a bit of IP. LTE is an IP-based network and that is the only way to go. Q How do you expect ESN to change how UK public safety control room operators work and how will this benefit the general public? A In the short term, ESN is a huge change in the communications network which carries significant risk for public safety, so APD’s focus has been to minimise any change for operational staff and not to present too much change at once. Our approach is not to change how they work, because there is huge risk in this for mission-critical organisations and a huge risk for the public and society. In the medium to long term, LTE and ESN will open up a whole raft of new applications, delivering richer content so that many tasks that are now pushed back into the control room can be managed out in the field. There will be richer access to data and the ability to share video and information instantly. Staff both in the field and in the control room will be empowered and informed to make better and faster decisions, because data will be more readily available. There will be less administration and less duplication. It will benefit the general public through emergency services organisations delivering improved service. For the police, information will be at officers’ fingertips. For example, stop and search need not take half an hour; it could be just a few minutes. An officer can check out information provided by a person they have stopped immediately on their handset. This will deliver many benefits: inconvenience to the public is reduced; the police are assisted to apprehend the right people; society is protected more effectively; and community relations are improved. Q How have you designed your system to reduce the learning curve for operators once ESN comes online? A We have deliberately designed our software so it has a familiar look and feel and workflow. The design principle we’ve used is like keeping your mobile phone, but switching mobile phone operator. It looks exactly the same; it’s just a different network. We have held regular workshops with users of our system. We have demonstrated our ESN software on a regular basis to users and non-users as it’s being developed, to get their feedback. We’ve had technical workshops, operational workflow workshops and training workshops. We’ve also hosted ESN webinars where we have demonstrated the software and we’ve had client visits to our premises. So we’ve had really heavy technical and operational involvement from our customers. We’ve talked to the techies and to the users in the control room. This user engagement has driven us to produce a product that meets our customers needs throughout the transition and beyond. Q What are the main benefits of using cloud-based control room systems? A ESN and LTE will create a host of opportunities for new features, enhancements and ways of working. Cloud gives us the opportunity to develop and deliver these new features at a fraction of the usual cost and keep ahead of technological changes and public demand. For example, in the UK we are seeing a rapid growth in knife crime, especially in London. We could develop a new feature, available instantly, via the cloud, to all of our customers offering keyword recognition. When a call comes in from an alarmed member of the public who mentions use of a knife, a message could flash up on the control room operator’s screen setting out the procedures for handling an incident involving a knife and highlighting available resources equipped with stab vests. This would protect police officers and other emergency responders, help deploy appropriate resources to deal with the incident and protect the public. Q What do organisations running control rooms need to consider when migrating over to a cloud-based system? A They need to think differently about how their control rooms operate. Control rooms today are based on a series of vertical applications. Instead, organisations that operate control rooms need to think horizontally – to consider what they want the technology to do, as opposed to what the technology is. They need to think ‘these are the jobs my control room needs to do’ and task the technology organisations to help them to deliver those tasks in a more efficient and effective way. Cloud-based technologies are effectively one solution, delivering efficient operational workflows for the entire control room, which your software supplier should be continually developing to meet public demand. Q What plans do you have to develop cloud-based control room solutions? A We’re already doing it. We started in Sweden, where we developed and launched the world’s first hosted ICCS, at Karolinska Hospital in Stockholm. This supports the efficient running of the entire hospital operation all day, every day. We also plan to launch in the UK and one other country within the next six months. Our cloud-based control room solutions are entirely scalable, flexible and adaptable. They will be available to all mission-critical organisations through a private cloud that adheres to the most stringent standards for information security, including ISO 27001. Q What are you doing to help improve interoperability and standardisation within the control room? A Our technology is wrapped in APIs, which means other organisations can interface with our platform through interoperability standards. Our technology talks to other technologies and other suppliers’ software talks to ours, in a standard way. This means the customer is not held in a stranglehold by any supplier. It gives technical and procurement options. It empowers the customer. Q What is your key message to mission-critical organisations and technology providers facing these challenges? A I would like to issue an open call to customers and technology providers to talk to us about the control room in the cloud movement. It’s there to be shaped by a community of technology providers and organisations in this space. It’s a collective effort – be part of it, don’t sit on the sidelines. My message to customers is ‘tell us what you want to see’; to tech providers it’s ‘tell us how you can add to this opportunity’. Join in, speak to us, let’s collaborate! If you would like to talk to APD about any of these developments, please get in touch on (+44) 01482 808300 or by emailing hello@apdcomms.com. I would like to know how you plan to address the receiving of 999 calls into a cloud based solution - BT don't have an answer Also, forces have had extensive mobile data capabilities for years without ESN, Stop and Search is hardly a good example of the benefits of wireless broadband data !